Woo hoo! I’m overjoyed to be posting from Polished Habitat instead of A Prudent Life for the first time! It worked out perfectly that we’re starting off the new name with a big before & after post. 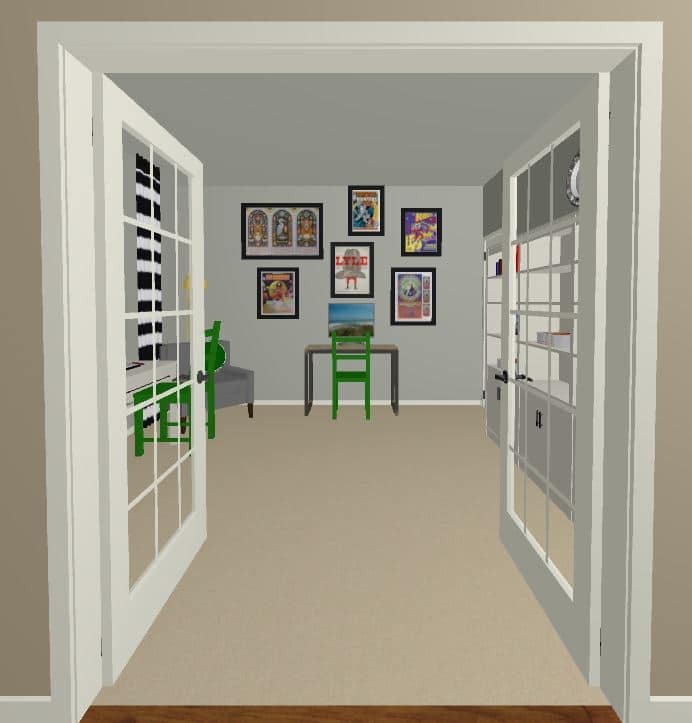 Way back in July, I shared the 3D design plans for our home office. 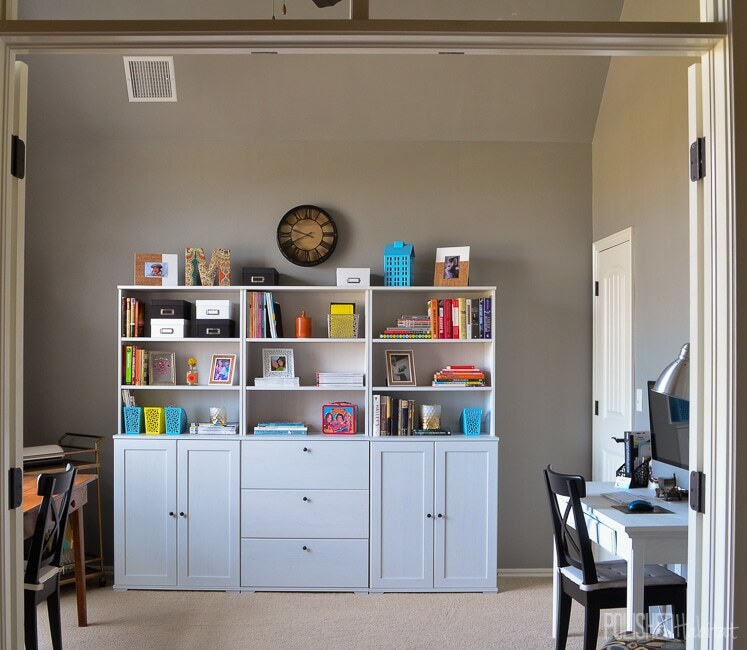 Quite a few money saving projects later, we have a finished modern space that is much more fun to work in! Just to recap a little, the office is primarily my workspace on a daily basis, but my husband’s computer lives there too. Which meant I didn’t want to go all 100% girly glam and block his manly creativity. 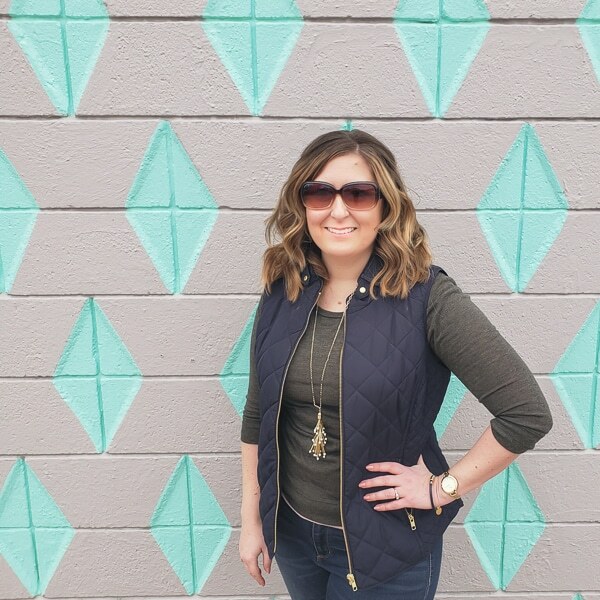 UMM: Big News, since this post in 2015 we TOTALLY revamped the office and went 100% girly glam after realizing I was in here all the time and my husband never was. New office reveal here! 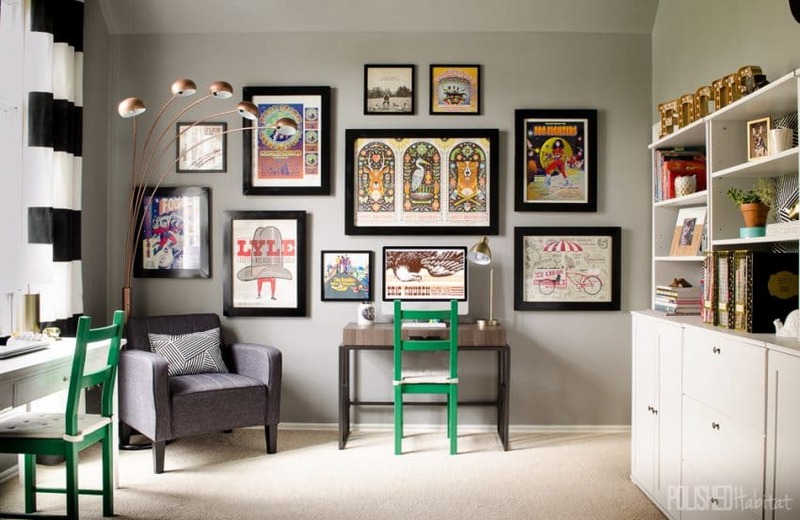 I created the design plan with a focal wall of concert poster art we have collected over the years. I might be a little in LOVE with it! As you can see, we went even bigger than planned with the gallery wall. As we played with the layout for the concert posters, we realized we already had some framed records that would be a great compliment to the posters. We built the poster frames ourselves, which saved us HUNDREDS of dollars. I can’t wait to share that tutorial! 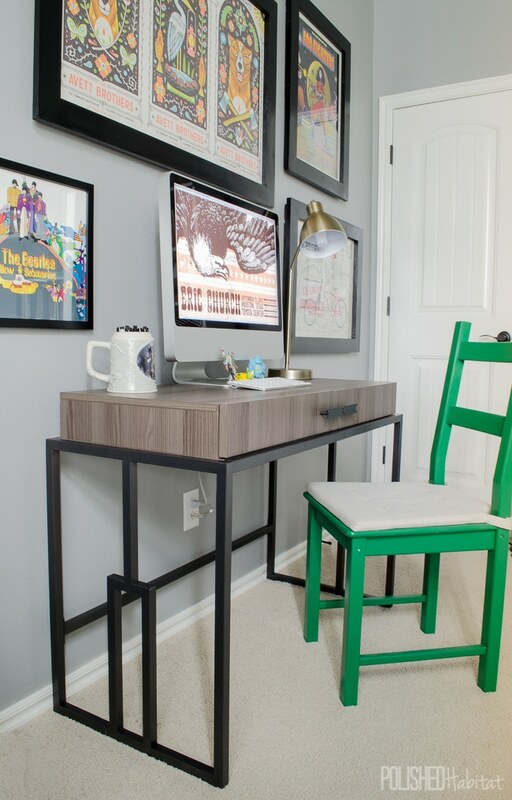 The husband’s new desk is the Sauder International Lux Writing Desk. 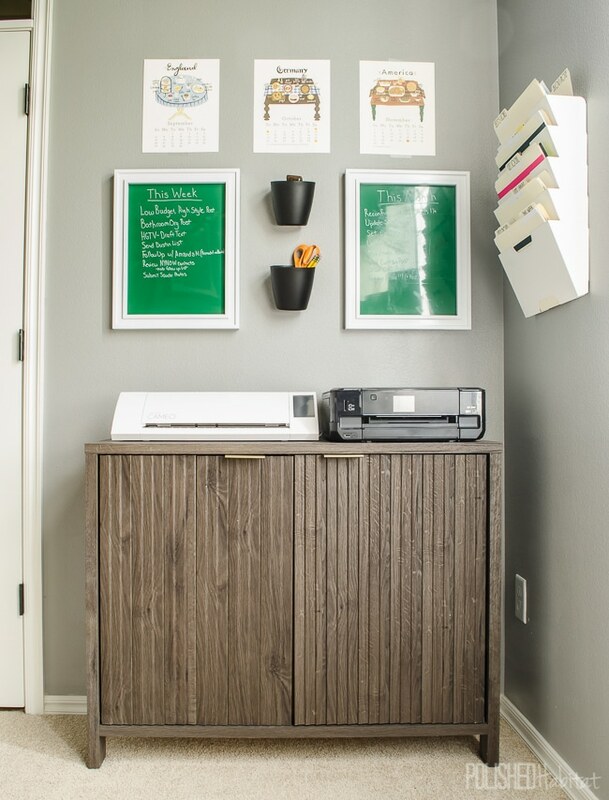 After my guest room post, Sauder reached out to work together on another project. When I saw the International Lux line, I knew this was the perfect opportunity to finish our office. It feels like their designers have been working overtime to come up with fresh modern pieces, which I really appreciate because it gives us an opportunity for affordable stylish furniture. We moved our existing bookcase to the right side of the room, which freed up space to add an accent chair (more on that later). The fun lamp was a freebie from my neighbor. Sometimes she purges and texts me photos asking if I want random things. In this case I said YES PLEASE! In addition to getting a new place in the space, the bookshelf was backed with Nate Berkus fabric to spruce it up a little. It was a crazy simple DIY (full tutorial here). Now let’s take a look at the progress on my side. Before, I had a large farmhouse table that I have a love-hate relationship with. Do you know how many piles you can make on a huge surface? Even when it was organized well, it was a magnet for clutter. 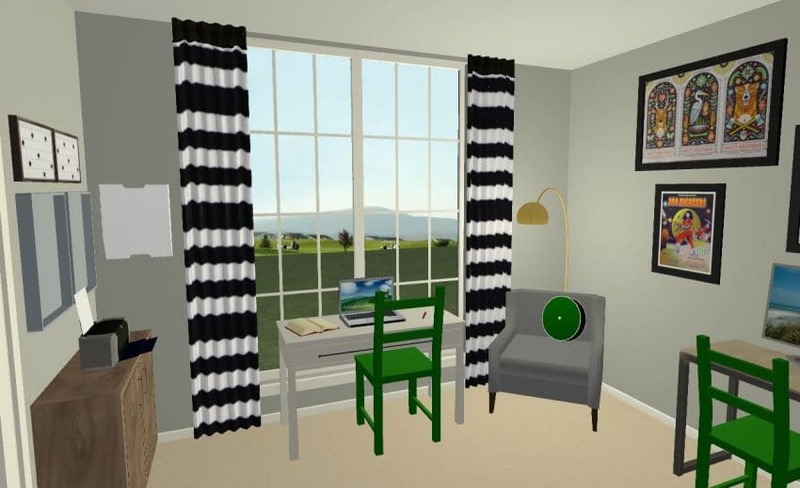 The curtains were also my nemesis as outlined in my Design Mistakes post. And the real deal! 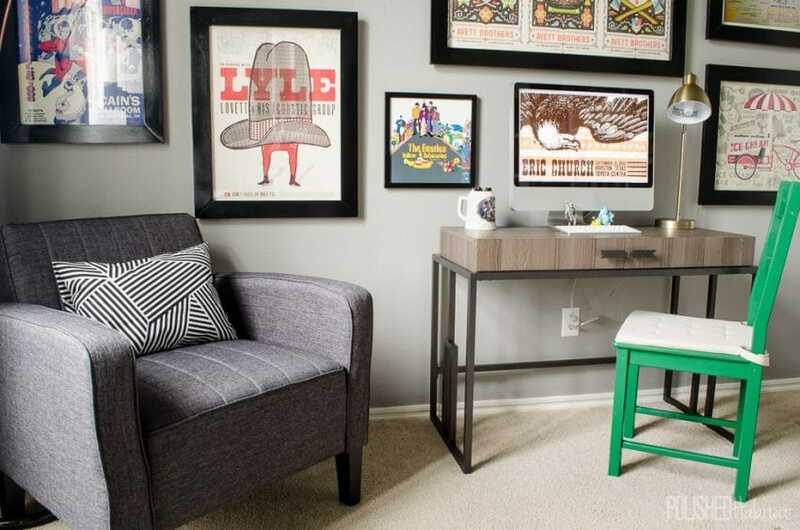 Ahh, the room has breathing space with the smaller desk. My “new” white desk is the one my husband used previously. It was a Target desk that used to be faux mahogany. A few years ago, we painted it white and extended it’s life in our house. 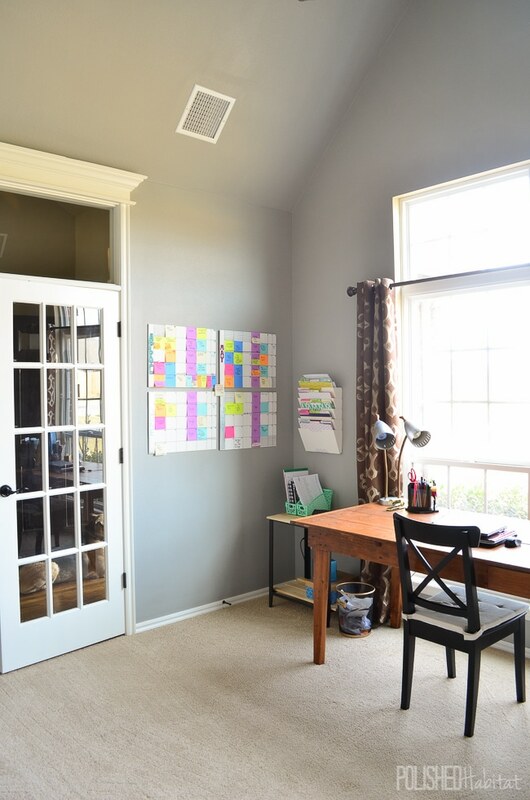 In the corner, I created a mini command center with DIY Dry Erase Boards (tutorial here) to keep track of my most important weekly tasks and monthly goals. 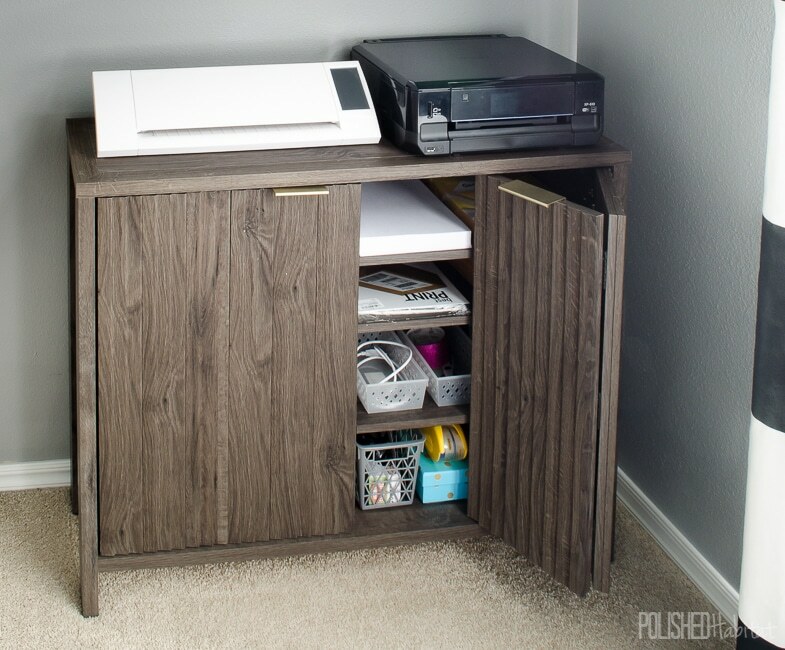 Under those, I used the Sauder International Lux Accent Storage Cabinet. It was the perfect size to hold my Silhouette AND our printer. Now when I fill Etsy orders, everything I need is all in one place. Having our extra paper and ink right below the printer has made my life so much more pleasant. The brass pulls for the doors are so chic! Remember when I said we’d come back to the chair? 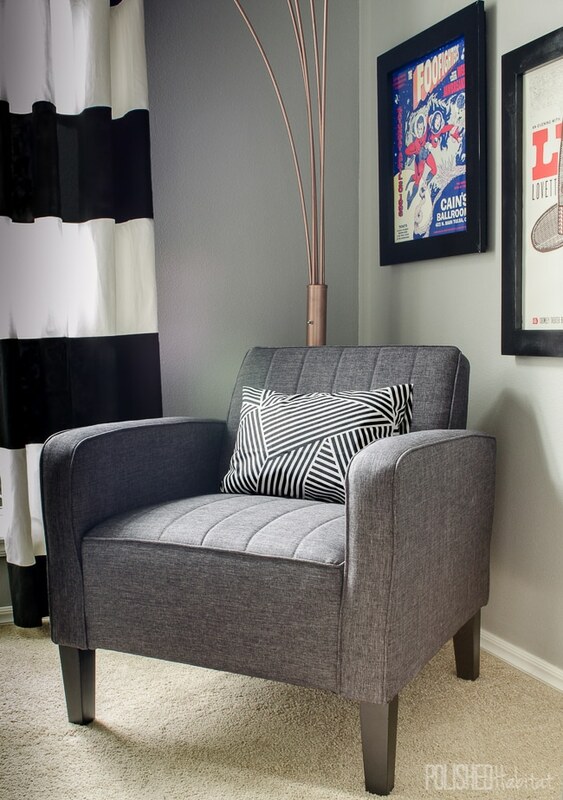 It’s the Ellis Accent Chair, and the cutest thing ever! The slope of the arms and suit-ish fabric make me feel like it came from Don Draper’s office. BUT…..
…I had a problem with my gray beauty. Insert serious sad face. After using it several times with no issues, it suddenly became a recliner. But it’s not supposed to recline. Bummer. It’s never good to get a defective product, but when you have received the product in exchange for writing about it, there is an extra level of despair when something goes wrong. On one hand, the next step was easy because I have very clear expectations of myself when it comes to sponsored content. I turn down most offers and only work with my favorite companies that I would buy from without blog involvement AND that I would post about without sponsorship. Above all, I’m honest with you, no matter what. I emailed my contact at Sauder, explaining the issue and she told me how to get ahold of customer service for a replacement part. It was actually nice to be able to evaluate that part of the company. After live chatting with a rep, she had me email her photos of the problem, and then was able to process the product replacement. She had no idea I was a blogger, and I was impressed with how accommodating she was. Our new chair back arrived, and it sadly didn’t fix the problem. Darn it! At that point, I knew it was time for a talk about how to proceed with the post. I let Sauder know how much I LOVED the look of the chair, but that I couldn’t recommend it with the known issues. UPDATE Feb 2016: Hallelujah, I came up with the budget to upgrade my desk and chair! 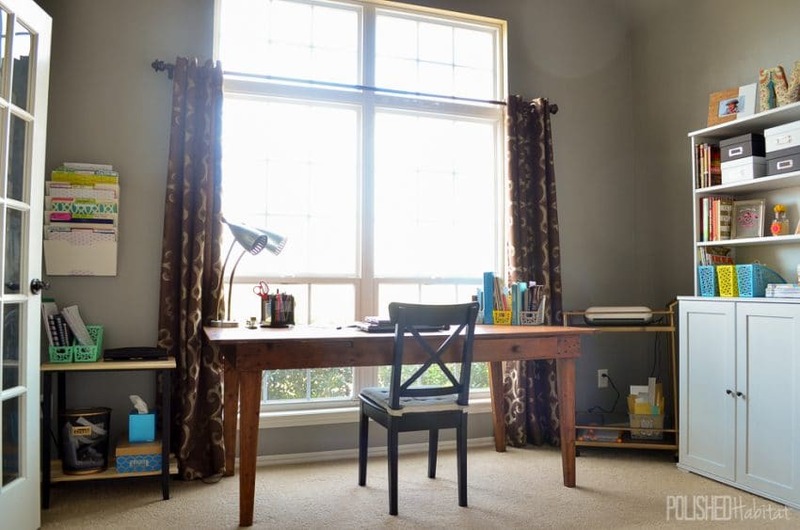 We used the writing desk and dining room chair that we already owned during the makeover to save money, but I had been hoping to eventually replace them to something more conducive for hours of work at one time. I am LOVING having more drawer space and an adjustable chair. UPDATE 2017: The office looks absolutely NOTHING like this now. 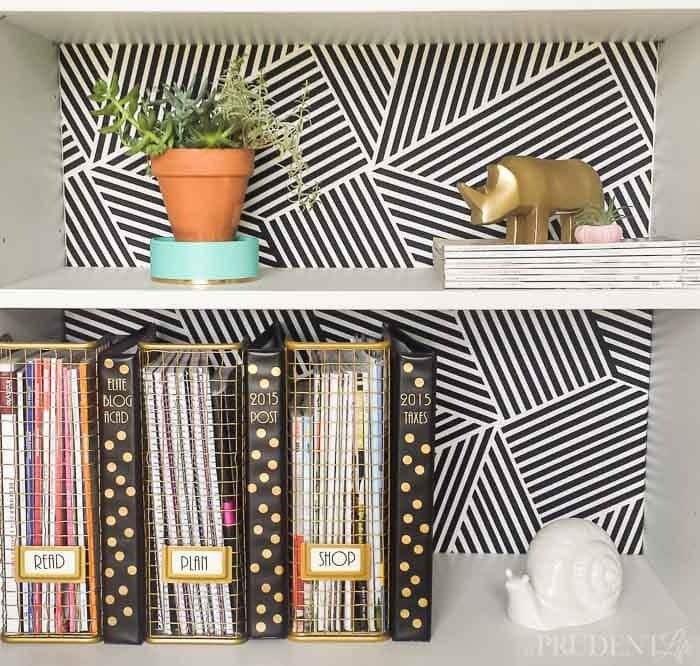 See the girly glam space here! Until then, I’d love you to pin the below image to your office board if you got any new ideas from the space! 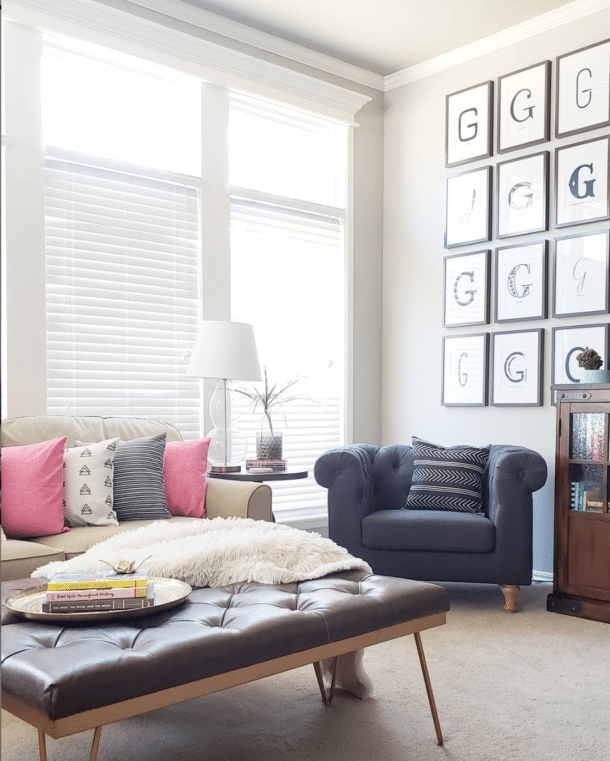 What’s your favorite part about this room makeover? That art is great, and I love the green chairs! What an inspiring space to work in! 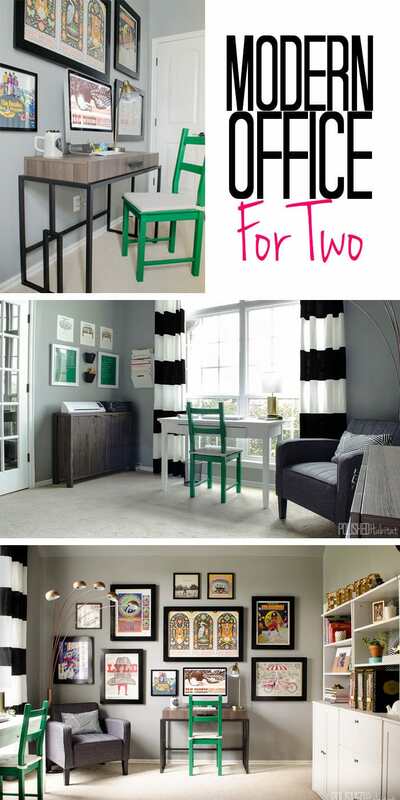 I’d love to know what green paint was used on the chairs! I’m planning on painting my son’s dresser a green like that. Love this room and color palette! Thanks Tahiry, It’s Emerald Green spray paint by Rustoleum. Wow! What a beautiful room. I absolutely love the curtains. My daughter-in-law gave me several pairs of the white IKEA curtains to use on the windows of our new home. I have been trying to come up with a plan to stencil them or dye them. The spray paint loves fantastic. I love the nice fresh clean lines. Great idea! Love this, where were your existing shelves from? Hi Mary – they are from IKEA. They used to be named BORGSJO, but I’ve heard they have changed them a little and relaunched under a new name. Where do you find your concert posters? Some of them we’ve had for a really long time, others have come from local shops in Tulsa and NYC. AllPosters.com has some, but the best way would be just to google a band name + poster (IE Foo Figher Poster) to narrow down the search. Good luck! Love your ideas and style! 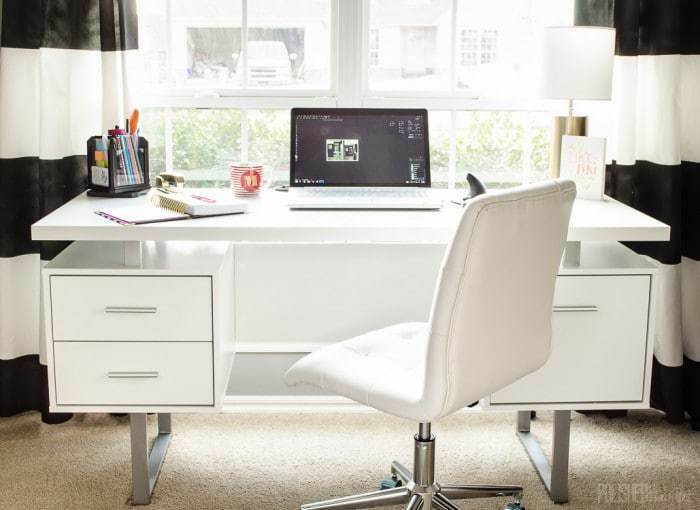 Where did you purchase your white new desk?! I love it! Hi Johanny, it was a old desk we had from Target that we painted white! Do you remember the name of it?? Its truly unique!